Class of '68's Randy Shayler and Byron Aldrich have been named to the Mishawaka High School Athletic Hall of Fame. Randy was inducted in 2001; Byron, in 2003. The Hall of Fame began in 1986. MHS describes the Hall of Fame as "a team united by the shared personal qualities of character, leadership, and sportsmanship." Randy was on the football, wrestling, and track teams at MHS. Byron was on the football, wrestling, and baseball teams. Russell ARNDT, J.D., Class of '21, teacher when Class of '68 was in 9th grade. Ward BAKER, Class of '24, teacher for Class of '68. John DANAHER, teacher and coach for Class of '68. Raymond DeCOOK, Class of '28, Director of Mishawaka's Parks and Recreation when Class of '68 was in high school. Eugene DYKSTRA, Athletic Director and Dean of Boys for Class of '68. George GULYANICS, Penn Township Assessor while Class of '68 was at MHS. Margaret HARRIS, Mrs. Ward Prickett (Maggie Prickett), Class of '26, mayor of Mishawaka for 16 years, 1964-80. Jack KLAER, Class of '29, organized MHS Alumni Association, founded MHS Booster Club, filmed football and basketball games, sportswriter for the South Bend Tribune. Jim MILLER, Class of '42, coach and teacher for Class of '68. Walter THURSTON, Principal while Class of '68 was in 10th, 11th, 12th grades. Milton ROSS, Class of '50, coach and teacher for the Class of '68. Al SMITH, coach and teacher for the Class of '68. Frank STEELE, Director of Health, Physical Education & Safety for Mishawaka public schools from when the Class of '68 began kindergarten thru 4th grade; Tupper Field was re-named for him in 1980. Marv WOOD, coach and teacher for the Class of '68; the real coach behind "the Milan miracle" of 1954, the basis of the movie Hoosiers; a genuine Hoosier gentleman. March, march on down to fame. Our coach and all the team are just what they seem. Hear all those Boosters talk! ____________ High may fight to the end. But we will win! Rah! Rah! Rah! Spread round you all your fame. Wont stop till were there. Above 1968-era photo is from Chuck Hoffman. Co-captains of the football team with the coach. 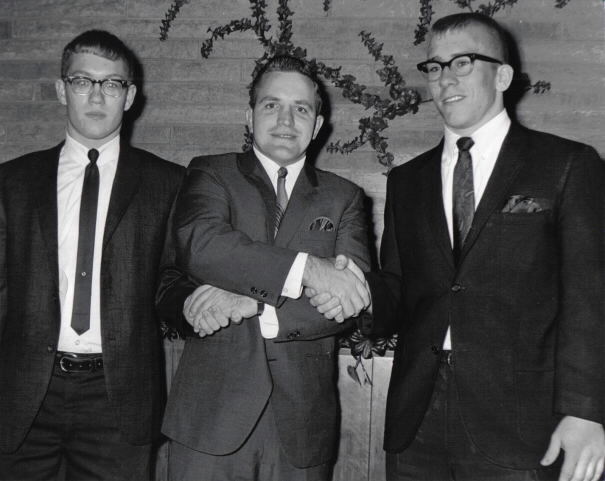 From left: Craig Salyer, Coach William Karpinski, Randy Shayler.